Not a bad start. In this episode I think I really miss the interactions between Aoyama and Yurine. Since Akagi has come out of seclusion for the most part, he’s taking over the relationship that Yurine and Aoyama had in the SP. It’s a little sad. Of course, Akagi’s and Aoyama’s personalities aren’t quite the same so it’s not the same dynamic as before. It’s still good though and it’s nice how we can see our oddball team changing ever so slowly. Although…pretty much all the members take a backseat in this episode as I think they were focusing more on Akagi’s development more so than anyone elses. We open with the police discovering the body of a young man in a park. As they put the man into a body bag, he springs back to life like a zombie before collapsing once more—completely dead this time. That is the first body. The next morning a second body is found. Kikukawa and the rest of the detectives are inclined to think this case is just a jogger dying while trying to stay healthy. Enter Akagi onto the scene who tells them to stop photographing the body and start photographing the wall for chemical evidence. Akagi is determined that this is a murder and gives his opinions as to why he thinks so. Enter Yurine who is upset that Akagi did not wait for him. Even more upsetting is the way that Akagi is treating Kikukawa and his team—essentially just like Aoyama did in the SP. They are all idiots wasting the government’s money when Japan has a huge debt already. This makes Yurine and Akagi bicker and Yurine reminds Akagi of a very important appointment the next day. Yurine and Akagi’s relationship is quite cute. Poor Yurine is treated like a servant and yet you know he’s necessary to Akagi as he progresses into not being a recluse any more. I am surprised that this drama opens with Akagi actually leaving his apartment since we ended the SP with him yelling and vowing to never leave his apartment again after a high school student called him a weird old man. Then again, it is a year later. He’s had more time to come out of his proverbial shell. Of course, Akagi doesn’t keep that promise. So what is it that Akagi is supposed to be doing? He’s supposed to be helping Yurine talk to a budgetary committee that plans on axing ST (short for Scientific Task Force) since they are a waste of resources. Yurine fumbles around and finally starts rattling off about how talented the members are, et cetera, et cetera. This leads to a snarky comment from his cohort who is now way above him in rank, Takanashi Kumicho, who says that Yurine is implying the detectives don’t know how to utilize ST properly. From this debacle, Yurine goes to Akagi’s appartment to complain. Akagi locks himself inside and said he only comes out to investigate cases and nothing more. He then texts Yurine that he will only come out if Yurine brings him a case. Poor Yurine. His life hasn’t gotten any easier in a year, has it? Yurine then goes to Saegusa’s office where he complains nonstop and forces a smile to say everything will be okay only to learn that his mentor and the one supporter of ST has officially quit! Yurine forces a smile again and says brightly that everything will be fine. Sure, Saegusa has confidence in Yurine’s ability to protect ST from being dissolved, but we all know Yurine doesn’t have the confidence himself. He dejectedly heads to his desk and Kikukawa wonders why he just doesn’t take himself out of ST. He just can’t give up on that team. Kikukawa and his partner (a girl whose name I haven’t caught yet) then confirm that everything Akagi deduced at the second crime scene was spot on. Plus, there was another corpse that was also poisoned. It’s an order from above—ST’s last chance to prove themselves. Akagi leaves his apartment to get a report from Yurine about the two cases so far and to look at the body of the first victim himself. Yurine asks if it’s possible for a person to become a zombie and Akagi says it is with the help of a certain poison—the one usually found in blowfish—tetrodotoxin. News to me. I don’t know enough of science to know if this is completely made up or not, but they talk of a drug called Zombie Powder which uses tetrodotoxin. A person can die and reanimate multiple times based on the dosage. Yurine goes to the meeting and as expected the team shows up late and hijacks the meeting. They start out by explaining about Zombie Powder by having Kurosaki ingest some. When the young man falls down “dead” everyone starts to panic. Yamabuki assures everyone that he’s cleared to handle poison. That’s not the point is it? The detectives gather and Kikukawa even throws a bucketful of water on the unconscious man. A countdown begins and Kurosaki wakes up, perfectly fine. This is to show that the criminal could have extensive knowledge of the poison and how it works. Or not. They don’t have enough evidence to go on right now. Aoyama then asks if the detectives understand what they need to do and that they need to listen to the ST team to carry out the investigation. Saegusa’s replacement, Matsuda Shiori is not amused. She tells ST that they carry out their investigation by her orders and that’s how things work. Thus…the team is kicked out yet again. Poor Yurine, he’ll be bald by the end of this series. He does scold his team for their behavior, especially Aoyama. They’ve been over this time and again to no end. He talks about being more orderly and then Yamabuki interrupts. That’s right. Aoyama has a problem with order. The girl does apologize to which Yurine confesses would have been impossible a year ago. It definitely shows some improvement. Now what to do when they’ve been kicked out of the investigation? Perform their own investigation apart from the MPD of course! Yurine knows this isn’t the best course and won’t endear Matsuda or the powers that be to ST, but what can he do but go with Akagi and crew’s wishes (even though he is the highest ranking officer and thus supposed to run the team). You have to laugh at the next scene which shows Yurine running around like a crazy man thanks to Akagi’s orders. Akagi has tried to interrogate a homeless man on his own, but his phobia just won’t let him do that. Thus he had Yurine run hard to get there to do it for him to which Yurine is not happy about. Nonetheless, he approaches the homeless man and begins questioning him. It turns out that he took the first victim’s cell. Yurine takes a newly purchased phone and hands it over to replace the stolen phone. Akagi takes the phone from him and opens it. He then finds pictures of a woman—the first victim Sugita was definitely a stalker! That’s a commonality right there! The first victim is a stalker and the next victim is a paparazzi. It turns out Sugita was stalking model Yagami Akiko. It also turns out that the reporter who broke Yagami’s love scandal with a much older man was the dead paparazzi. Suspicious. Thus Akagi and Yurine go out to question Yagami. Yurine is a brusque man, but he’s go more care when it comes to questioning—Akagi not so much. Sick of Akagi’s interjections from the sidelines, Yurine brings him over where Akagi calls Yagami a murder suspect to her face and threatens she will be arrested next. Up shoots poor Yurine’s blood pressure even more. The two go back to their office where Yurine believes the stalker quit his stalking after the love affair scandal broke. Aoyama has him go through his whole breakup process if a girl expresses interest in him and is then found with another man instead. After talking through this, Yurine gets what Aoyama is getting at. The stalker wouldn’t rationally give up. So something is definitely suspicious. Thus Akagi and Yurine go to visit Yagami’s boyfriend. He says that the stalker turned his attention from Yagami towards himself. His secretary brings out tons of angry letters. Forensics shows that the handwriting from Yagami’s letters and her boyfriend’s letters is from Sugita. But something is still amiss for Akagi and he yells that Yurine is more of a distraction than help when Yurine recalls that both victims were wearing the same brand of running wear which is a brand Yagami models for—even more suspicious! Unfortunately, the brass have gotten wind of the ST team’s private investigation into the murders. Matsuda is not happy that they are acting on their own when they should be acting on her orders. Yurine is caught between the proverbial rock and hard place. Matsuda then says that the grade…for Yurine or the team?…is a B+ when they need to be a AAA. 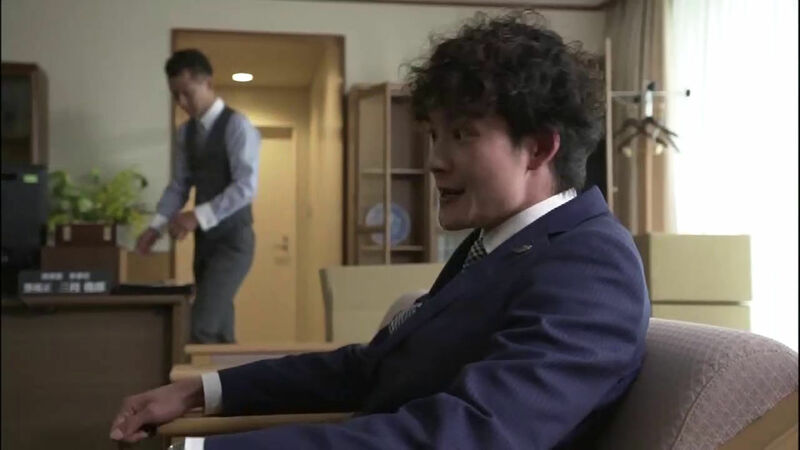 Yurine dejectedly kneels in front of the elevator and begs Kikukawa to buy him a drink, but the older detective refuses since he has to investigate. Thus Kikukawa throws Yurine to his new partner who refuses since she’s disgusted by what the ST team is doing. Yurine smiles and walks over on his knees. Really? So is he! LOL. Needless to say that shocks the young woman. The two go to Saegusa’s bar and Yurine gripes about how he told his team they need to report things to the brass, but Akagi never listens. The young woman understands as Kikukawa never listens to her either since she is a newbie to the the team. Yurine tells her that Kikukawa was like that when he was partners with him, too. The girl then tells him while she’s stuck, he can be free of ST once the unit has been broken up. So why is Yurine working so hard to save them? Because they are exceptionally talented, AAA detectives. He then talks about the team, their abilities, and their issues (flashbacks from the SP inserted here). Everyone has issues and emotional scars and Yurine wishes to create a special place for his team to belong. He’s upset that Akagi doesn’t understand this. Saegusa then talks about people’s way of coping and how Japan has become a scary place under their watch. The next morning Yurine waits for Akagi. He tells his forensics expert that he is ranked higher and thus he wants none of Akagi’s looking down on him to which Akagi calls him an idiot since he’s never looked down on him. Enter Takanashi who comments on how he’s shocked Akagi isn’t holed up anymore. Akagi says the door to his heart is still closed and to tell “him” to not knock so easily. I’m not sure if he’s saying he doesn’t want Yurine knocking so easily or Takanashi. Anywho, Takanashi tells Yurine to drop formalities when they are alone. He also complains about the stress of promotions and how people don’t want to listen to him because he’s so young. He doesn’t think Yurine gets it. Yurine does, believe me, with that team, he does. Takanashi also worries about Akagi. His biggest fear is that the brilliant and defective Akagi Samon will become a monster like the ones he hunts down. More and more evidence is mounting against Yagami. One victim died from puffer fish toxin while the other from a Caribbean frog poison. Of course Yagami took a trip to the Caribbean recently. Akagi points out it’s too convenient that everything is pointing to the model. They then learn a rival of Yagami’s went on the trip with her. Turns out she’s Yagami’s manager’s lover. Yes she hated Yagami and how the manager couldn’t get over her (they are ex-lovers) but she would never kill anyone because of her jealousy. She rushes out of the bar and Yurine scolds Akagi for his direct and cruel methods of questioning. Akagi reports that the model’s body language clearly told she wasn’t lying. So it was just a test? Akagi cannot believe that Yurine is only understanding him now. The bartender then reveals that the manager is involved with drugs. Another suspect! The team regather and Yurine puts it all together to report the whole case about how it was all orchestrated by the manager. He and Akagi to the manager’s house only to have Kikukawa and his partner beat them there. The manager runs for it. Kikukawa and his partner lose the man, while Akagi and Yurine manage to nab him. The man is an ex-boxer and easily handles Yurine. Akagi, of course, cowardly tries to avoid the man. Yurine pulls a gun, but the man easily takes care of him. Enter Kurosaki…somehow he managed to come in the nick of time…and he easily takes care of the manager who then starts showing symptoms of being poisoned, too! Yurine and Kurosaki both call for help as an upset Akagi realizes the real truth behind the case. They go to Yagami’s boyfriend’s house. The couple have just become engaged. It turns out that everything…from the paparazzi breaking the story to Sugita stalking Yagami to the murders…was all orchestrated by her fiancé who was terrified Yagami would leave him because of the large age gap. He goes into the kitchen and takes the poison. He returns and says he will die there. Akagi isn’t concerned because he had Yagami switch the pills out. Only the woman didn’t. She believes the man she loves should die for his sins since he was so stupid. She loved him and did not need his evil deeds to make her turn to him more and more. Looks like Akagi didn’t count on Yagami’s complicated feelings to change his carefully orchestrated plan. He doesn’t die, luckily. When they leave the crime scene, Akagi calls her a stupid woman to her face and tells her she almost became a murderer. Yurine is NOT pleased by this turn of events at all and you can guess as to why. Matsuda calls out Akagi to the rooftop for his report. Yurine enters when Akagi ends his report with an almost murder having nearly taken place. Yurine…slaps him…twice. Akagi thinks this is because Yurine is pulling ranks and trying to put him underneath him (that’s what got him the second slap). Akagi says he’ll seek compensation and leaves. Matsuda tells Yurine to leave ST. Yurine says that because of how Akagi is, there is no way he can leave that man alone. This is not the answer that Matsuda wanted. She sees Yuki downstairs and says the grade has fallen to a B-. Yuki complains the woman hasn’t changed. What is the history between Matsuda and Yuki as they both don’t seem to like one another? Akagi dons Gakky once more and goes to Saegusa’s bar. 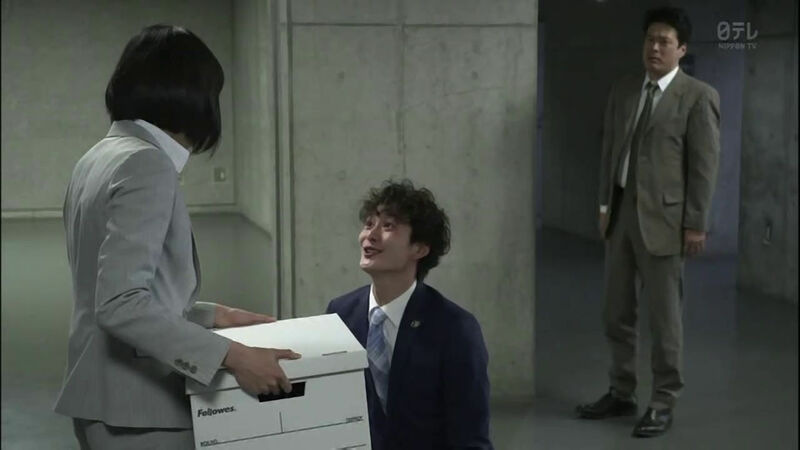 The older man helps him out of the suit and Akagi says that it is time to put Gakky to rest. Yurine storms in and almost storms back out, but he angrily sits down and asks for coffee. He tells Akagi he won’t pay back Japan’s debt nor give him compensation for slapping him. He didn’t do it to show himself as a superior, but to let Akagi know that his actions at the end of the investigation were wrong and that if he’s not careful, he’ll become a monster. Akagi then does a shocking thing—he apologizes. End episode. It’s to be expected, but I did like that ST wasn’t in danger of being dissolved in the SP. Now we are fully into the typical oddball detective drama with a team with loads of problems that must protect themselves from being dissolved. I’m also not liking the woman they brought in to replace Saegusa and I’m wondering why he went from the police force to owning his own bar. I’m sure there’s a story there we’ll hear about later. Just like we’ll hear why it seems Matsuda has it in for the team upon arrival. 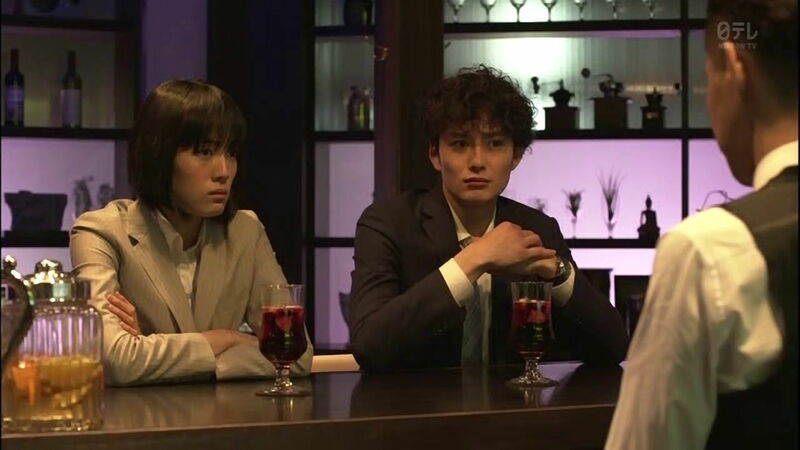 I feel like lately a lot of ‘quirky’ or oddball male characters in dramas have gotten perms. O_O I wonder what’s up with this trend, heheh. I think Okada has natural curls because he does seem to have curly hair in a number of dramas and movies. Very true! It’s hard to tell whose natural and who did it to fit their drama/movie role.